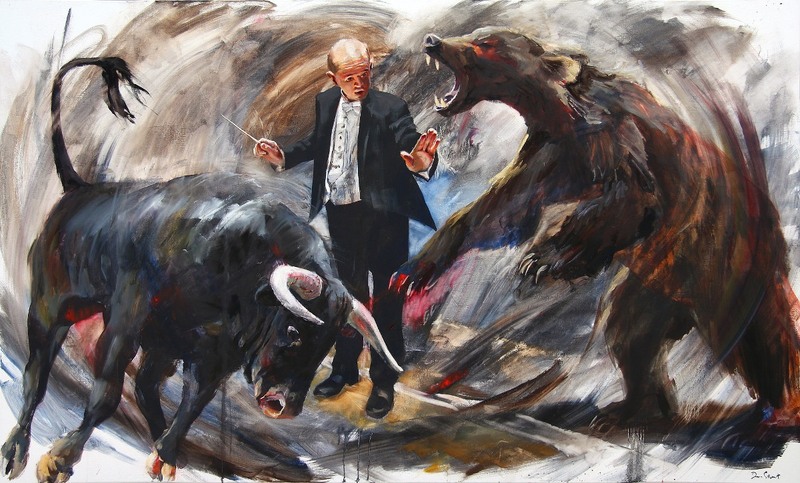 Duncan Stewart posted a photograph of this painting on Facebook with the caption: "I don’t profess much knowledge when it comes to bear and bull markets but… is there some third party with greater skill, greater wisdom, governing the play that is my life? Could this same scenario play out in contexts far removed from any financial arena? The Maestro sublimely moves the baton from bullish to bearish or vice versa. My head says one thing, my heart another... Which will triumph, fear or faith?" Like Duncan I was clueless about the financial market. I'd heard about bull markets and bear markets and now I was intrigued to find out more about the terms. I did some investigating and learnt that fights used to be staged between these animals. The bullish market signifies an energetic, optimistic, upward trend, in keeping with its namesake, who thrusts upwards with its horns. A bear slashes downwards with its claws. The pessimistic, suspicious, downward trend of the bearish market is characteristically heavy and lumbering. 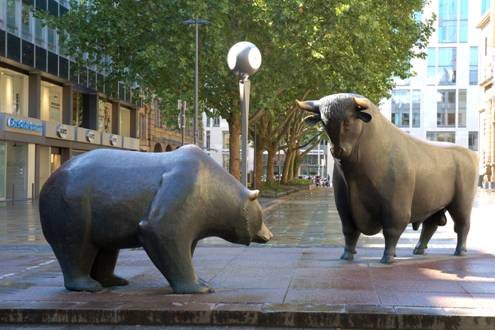 The sculpture below by Reinhard Dachlauer (1922-1995) is to be seen in front of the Frankfurt Stock Exchange and expresses these two trends. When I saw Duncan’s painting Tension and Timing for the first time, I was stunned. It was the exact pictorial representation of something I have been learning lately: that when life sends shocks your way, you'd better wake up and take note. The things that happen to you in your life are carefully designed to teach you what you need to learn and you can only learn when you receive each event as a gift from God, who loves you. It is so hard when things go "wrong" to avoid thinking either "Life is so unfair!" or the opposite: "I deserve this! I knew I'd be punished. It's all my own fault." Those are our thoughts when we're on auto-pilot and they are not the thoughts of one whom the Son has set free. Isaiah 45:5-7 - I am the Lord, and there is no other; besides me there is no god. I arm you, though you do not know me, so that they may know, from the rising of the sun and from the west, that there is no one besides me; I am the Lord, and there is no other. I form light and create darkness, I make weal and create woe; I the Lord do all these things. Romans 8:28 - We know that all things work together for good for those who love God, who are called according to his purpose. 1 John 4:18 - Perfect love casts out fear. Duncan Stewart: Tension and Timing, 2012, oil on canvas, 200 x 150 cm. Duncan Stewart is a multi-disciplined artist from South Africa. He received his National Diploma in Graphic Design, with several Merit Awards, from Natal Technikon in 1993. He continued to explore and develop his visual language by working in the design and advertising industry before relocating to Italy. In 2003 Duncan received the equivalent of a BFA from Lorenzo de’ Medici Institute in Florence. As a Christian, he is committed to the integration of faith and art in a pluralistic, multicultural society. He believes all transformation, whether social or political, begins on a personal level, on the level of worldviews and personal belief. True to his faith and his calling as an artist, he creates powerful visual parables for the purpose of investing a Divine narrative into everyday realities. His personal logo shown below speaks volumes. Like the little boy with the loaves and fishes, we need but hand over what we have to Jesus. He will multiply it to feed the hungry. Facebook fan page: www.facebook.com/pages/Duncan-Stewart/40963494308. See also www.duncanstewart.co.za. Erna Buber-deVilliers is a retired high school art teacher who enjoys writing and many other leisure pursuits.